Chocolate Easter Bunnies | Who Are You Calling Crafty? Well this is Booga’s first Easter and I really wanted him to have his very own Chocolate Easter Bunny but he is only 6 months old. 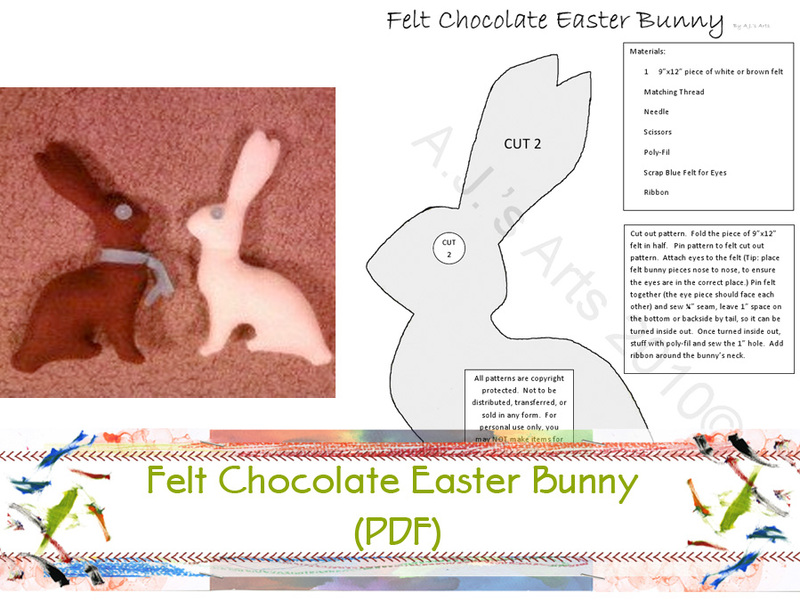 I found another blog Raised by Wolfesand she had a great idea create a “chocolate bunny” out of brown felt. I had to make one for my little man. I drew my own bunny pattern (my printer is out of ink) cut it out and cut out my felt. 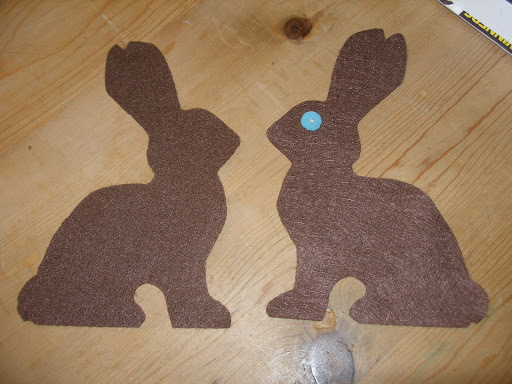 I also cut two blue circles for the eyes and sewed them on with yellow thread before sewing the bunny pieces together. I hand sewed the bunny together inside out and left a space so I could turn the bunny right side out. I stuffed the bunny with poly-fil and sewed it up. I also made one for the Princess a white bunny. Please ignore the horrible pictures I took them last night with my cell phone. I have to find where I put my ribbon for the Princess’s bunny, I think it is somewhere in a box in the garage. Since I just cleaned my craft room out you would think this would be easy – not really because I just labeled the boxes Craft Stuff – D’OH! I will scan in my template I drew and type up some directions and convert them to PDF, so anyone can print it. Since this isn’t my idea I don’t feel right making them up and selling them in my Etsy Shop but if you really want me to make one for you, let me know. I hope everyone has a wonderful Easter and there will be more Easter Crafts to come this week!